Will I be able to grow something without it dying? Strawberries are one of the things I grew as a child. I know what a ripe strawberry tastes like, and I believe the last time I ate one was after a trip to a pick your own (PYO) farm with my Nan. How long has it been since I've tasted a ripe strawberry? Over 15 years. Supermarket strawberries are under-ripe strawberries, and as with pineapples they stop ripening as soon as they are picked. I am a bit discouraged about growing anything these days, because my mental health issues make it unlikely I'll be able to keep up with anything that requires regular work. A good example of the issues I'll face is the fact I had an allotment in 2011 that I had to give up in the first year because I just didn't have the energy to do all that work. Then there was the travel time and it requiring me to leave the house regularly, both things that were just not helpful to my mind. Strawberries should, in theory, be easy to grow and with the right care should produce enough strawberries for me to eat. £2 for 227/400/454 grams (same price all year, only thing that changes by season is the weight) of under-ripe strawberries at the supermarket is probably the reason why the only fruit I tend to eat are bananas, raisins (which I buy on 3 for 2), and broccoli (calabrese, frozen florets). Home grown strawberries may well have the potential to be one of my 5 a day for several months of the year. The other things I'm thinking of growing are purple sprouting broccoli, tomatoes, cucumber, and mange tout. Tomatoes, cucumber, and mange tout should produce fruits/pods during August and September. Purple sprouting broccoli (early and late) should produce buds/heads in February, March, and April. The 3 varieties of strawberries I'm looking at should produce berries from May/June to October/November. Ignoring the possibility of storing any surplus in the freezer, between February and July I'll have one of my 5 a day from the garden, August to September 4 of my 5 a day, and October to November 1 of my 5 a day. That means over the course of a year, it is possible those plants could provide 480 of my 1,825 portions of fruit and vegetables. That's a quarter of the recommended portions of fruit and veg, grown by myself. As already mentioned, my mental health will likely get in the way of gardening unless it is very low maintenance. I actually bought some strawberry plants in 2011 but they stayed in my room in their packaging and were eventually thrown out. If they make it into soil they have a chance of survival. In soil but still grown in the same horizontal plane (raised beds, containers). As with most things you can do in different ways there are advantages and disadvantages for each method of growing. Growing in the ground, for example, means the soil retains more heat and moisture, but the plants are more prone to slugs and snails and the fruit more prone to slugs, snails, and mould. Containers get colder in the winter, and are also more prone to slugs and snails, and also mould depending on whether or not any matting is used under the plants. They also need watering more often than they would need in the ground. Growing vertically may make birds more of a problem than slugs and snails, and dry soil may also be more of an issue than growing in containers. Since the fruit hang in the air rather than on soil/matting, mould should only really affect fruit growing on the plants at the very top. I have decided I am going to try and grow vertically using a Flower Tower. It is supposed to be designed in a way so that all levels receive the same amount of water, and watering is as simple as filling a central tube to the top with water. The Flower Tower is currently £22.67 on Amazon. The second thing needed is compost. The Flower Tower on Amazon only gives its dimensions: 15.2 × 15.2 × 86.4 cm. .r2h gives an approximate capacity (without subtracting the volume of the central watering column) of 15 litres. Wilko sell a 15 litre bag of multi purpose compost for £1. It should be OK for strawberries for a few years, although they might need feeding due to nutrient depletion in the soil. As for the strawberry runners, a triple pack of 12 runners of each variety (Cambridge Favourite, Florence, and Flamenco) is £34.99 at Thompson & Morgan, with £4.95 P&P. A tomato feed is suitable for strawberries. 2.5 litres of Tomorite costs £8.36 on Amazon. That brings the total cost in the first year to £71.97. There is an obvious problem with my choices. Containers are made of plastic and the plastic manufacturing process pumps CO2 (and other stuff) into the atmosphere and plastic degrades (although black plastic should offer some UV protection). Peat-based composts contain peat, and peat bogs are CO2 sink-holes. Finally, fertilisers can be bad for the planet because if based on mined products there is a finite amount that can be mined. It also doesn't make sense to unsustainably keep adding fertilisers to soil if it is possible to sustainably provide food crops with the nutrients they need to grow. Run-off from nitrogen fertilisers are making our water more acidic, and H2O, by definition, should have a neutral PH. You'll notice I haven't costed in any pesticides—I won't be using any. I believe in using nature to control pests. There is nothing quite like seeing ladybird larvae crawling over your plants, knowing that black spiky insect with orange spots (in the case of the 7-spot ladybird) will munch its way through aphids as it grows into an aphid-eating adult. When it comes to pests, there are a few that can affect strawberries in the UK, such as aphids and strawberry seed beetles. The glasshouse red spider mite (AKA the two-spotted spider mite) might also be an issue when the weather is warm and dry (or the strawberries are grown in a greenhouse). Green lacewings are another predator that is good to have around since their larvae eat aphids and spider mites, among other things. Unfortunately, before I got thick curtains, my bug zapper killed a lot of them. Another helpful insect are hoverflies. Then there is the destroyer of crops: the vine weevil. Although they can't fly, they can jump. Given the flower tower will be near a wall no matter where in the garden I put it, using glue around the base or creating a makeshift moat will not prevent the adults jumping from nearby and laying their eggs in the soil creating a new generation of root-destroying larvae. Vine weevils can be a big problem in containers. There are nematodes available that can kill off vine weevil larvae, but it is a tad pricey and cannot be stored for future use. As for diseases (some of which might be spread by aphids) there are a few that affect strawberries, with digging up and cremating the infected the "solution" for the worst ones. Botrytis is a fungal infection. Removal of plant debris, ventilation, and not watering from above can help reduce the risk—all of which are easy with a flower tower. Verticillium wilt is a fungal disease. It causes dieback and wilting. The risk can be minimised by using new compost, avoiding using compost/soil previously used for other plants susceptible to verticillium wilt (especially anything in the Cucurbitaceae and Solanaceae families), and removing (and distancing from) weeds. Dig up and burn infected plants and surrounding soil, and don't use soil for susceptible cultivars for at least 4 years. Red core (AKA red stele) is a fungal infection. Good draining soil can help as (to quote Wikipedia) "the zoospores swim through the water in the soil to find roots". It can be spread by anything that can transfer dirt from elsewhere, so sanitising tools, using compost you trust, and buying disease-free plants can potentially avoid introducing the fungi. Dig up and burn infected plants and surrounding soil, and don't use soil for non-resistant strawberry cultivars for at least 4 years (the spores may remain viable for 13–15 years). So, I have everything except a potting medium (if I want to avoid peat-based composts) and fertilisers (if I want to avoid contributing to peak fertiliser—phosphorus and potassium are finite resources). Some vegans may not like the idea, but I have a box of fish, blood, and bone I bought back in 2010–2011. I'm not sure if it is dissolvable (box is behind my home server, several fora suggest not) so I may end up just mixing some of it with the soil when planting the flower tower in the first year. If it provides enough NPK for a whole season, that just leaves something that can be dissolved for topping up in years 2 onwards. It will probably work out expensive if I buy online, but making my own "potting mix" does sound like the best way to know what I'm growing my plants in. The problem is there are a lot of different things available, so knowing what to use in a mix is going to be something I need to work out. Others may or may not be sustainable. Sustainability is about using the same amount or less of something than is replenished. The planet cannot support an infinite number of horses, so even manure could be unsustainable if its production uses more resources than are replenished. In fact, there isn't a single thing on the list that this doesn't apply. Rockpowder may be sustainable. It (basalt) comes from cooled and solidified lava/magma and/or the ash from volcanic eruptions. We're talking about rock formation and volcanoes. Do we use less than is produced from active volcanoes, or do we use more and the only way it can be called sustainable is by claiming Yellowstone will blow soon? As for everything else, it comes down to amount used per year versus amount generated per year. Outputs versus inputs. Coconut coir was, like fish meal, a waste product. Fish meal use has increased to the point we are now killing fish just to use for fish meal. So, while coconut coir is sustainable at present, we might reach a point where we are growing lots of coconut trees not for the coconut but for the coconut's husk (coir). Anyway, I am going to treat the possibly sustainable list as sustainable. Since I have some fish, blood, and bone, as well as some vermiculite, I will use them if possible because even if they aren't sustainable there is no point wasting them. It should be noted that my vermiculite more than likely contains asbestos. What I am thinking is 50% coir; 30% composted (well-rotted) horse manure; 10% volcanic rockdust; 10% vermiculite; and 30 grams fish, blood, and bone. The problem with fish, blood, and bone: everywhere says how much to use for ground surface area. 3.14 * 2 * 0.5(15.2 cm) * 86.4 cm ~= 4,123 square centimetres ~= 0.4 square metres ~= 4 square feet. 70 grams per square meter ~= 30 grams in 15 litre flower tower. Alas there is no way to know what mix to use. Should you only use manure in the ground and never in containers? Experimenting with soil mixes is something that can be done another time, what I need is something that looks like a standardised potting mix that is peat-based (since that should "just work") and is not as variable as the Wilko stuff (going by reviews). The problem with Google and Youtube is that almost all the top results on anything gardening related appear to be all about growing weed. So much so I have actually compared it with strawberries (in terms of requirements) so I can try and decipher what potting mixes and substrates would be suitable for strawberries. It turns out weed and strawbs have similar NPK (Nitrogen, Phosphorus, Potassium) requirements at different growth stages, as do most plants. Rather than try to work out how much nutrients are needed (e.g. adding fish, blood, and bone to the potting mix before planting) I have decided to just go with a decent sounding potting mix and use feedback from the plants themselves for feeding/fertilising. As for the potting mix, I have decided to use BioBizz All-Mix (£15.35/50L). It is 35% garden (reed sedge?) peat, 30% perlite, 20% sphagnum peat moss, 10% worm castings (from a diet of rock minerals and organic potato peals), and 5% BioBizz Pre-Mix (a combination of organic fertilisers, rock meals, trace elements, and fungi). I'm not completely happy with it being 55% peat, and assuming the rock meals/minerals are non-renewable the only thing in it that is probably sustainable is the worm castings from the potato part of their diet. I contemplated making my own (swapping the Pre-Mix for fish, blood, and bone) using 55% coco(nut) coir instead of the peat, but I'm scared the bare root strawberries will hate the mix and die. The potting mix sounds like it has a consistent consistency going by the ingredients, and they don't use council/municipal green waste that could be contaminated (e.g. with lawn weed killers and rubbish), and it is organic (although probably not sustainable). As for the Flower Tower, I'm now unsure about it. Reviews are mixed, and it looks like I may have to replant them every year. Applying fertiliser (non-liquid) is impossible, and I'm not convinced on the amount of space each plant would have for roots. Stacking containers look like a good idea. The problem is some of them don't have sufficient drainage, aren't structually strong, are too small, and some say they are self-watering but the watering part is unreliable. Now, there is an alternative: the Lechuza Cascada 3 tier set. Unfortunately it is pretty expensive—£169.96 + £10 P&P. The Cascada 3 tier set is available on Amazon Marketplace for £128.95. Alternatively, the Cascada is currently £26.13 £23.46 each on Amazon and the 3-piece connection kit is £36.29, which would make it £114.68 £106.67 and eligible for Prime delivery. Something worth pointing out is there is only 30 centimetres headroom for plants between Cascada tiers (plenty sufficient for regular strawberry plants). According to the notes with the assembly animation montage, in order to keep the centre of gravity low, the bottom planter should be planted before the middle and the middle before the top, and the plants in the top tier should not grow more than 50 cm in (vertical) height. Also, the tower should be no more than 3 tiers high, the screws need to be checked regularly to see if they need tightening (manual screwdriver only), they should be placed on a level surface sheltered from wind, and if moving the tower should be disassembled from top to bottom first. What disassembly before moving means is removing the top tier, removing the middle tier, moving the bottom tier, adding the middle tier, and adding the top tier. The base of the middle and top tiers will not be flat unless the tier connectors screwed to the base are removed—if moving them through a house or by car it might be worth removing the middle and top tier connectors and also plugging all 3 containers with the red drain plug. As for rotating the tower a quarter turn every so often so the plants get the same amount of sunlight, it might also be worth removing the middle and top tiers, rotating the bottom tier (connected to the base), and then adding the middle and top tiers back. Using the water level indicators as a guide to line up the rotation of each tier will make it a simple task, with the only thing needed to remember is whether you have been rotating them clockwise or anti-clockwise. Since I'm right-handed I think I'd find rotating anti-clockwise more natural. Having found the dimensions on the Lechuza Web site, the Cascada holds 19 litres of soil and 8 litres of water per planter. Those 19 litres includes the space occupied by the tiering connectors, so for the bottom and middle tier I need to subtract that volume. It takes up 17 centimetres of height in the soil area (the connector is 40 cm in total height) but the radius and diameter is not shown. I'll just assume I need 3 × 19 litres of soil = 57 litres. That comes to a total of £177.31, plus the cost of fertilisers. Assuming total fruit per plant is 200 grams in the first year, 350 grams in the second year, and 400 grams in the third year, each plant will produce 950 grams of strawberries over 3 years. With 36 plants, that is 34.2 kilograms, and at £2/400 grams that is 85.5 punnets @ £2 or £171 of strawberries. So although it will be possible to eventually work out cheaper than supermarket strawberries, a 3-year cycle would mean buying at least 2 more 3-tier planters. At the RRP price of the Cascada 3-tier it'd take a longer time to break even, whereas at least on offer it is possible the amount of money put in will result in an equal amount of fruit come out. The Cascada would take care of my plants when my mental health prevents me from doing so, and since each tier doesn't rely on water coming down from an upper tier there is no chance of one layer of plants getting more water than the others (except perhaps the top layer when it rains). The Cascade also takes up more space than the Flower Tower—a 49 cm diameter at its widest versus a 25 cm diameter at its widest. While I could probably have found the space for three or four flower towers I'm unsure about the same number of 3-tier Cascada planters. It will, however, be a sort of experiment. Once I have set it up I will have to water it every week or two once the plants are established, apply some fertiliser once a year, and the two main things will be picking the fruit and propagating runners for new plants. Propagating runners from a Flower Tower did at first leave me questioning "how will that even be possible?" 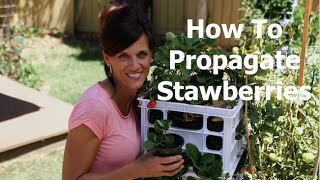 I later found a Youtube video that showed a rather ingeneous (and simple) way of propagation. Basically it should be possible to root strawberry runners using small sandwich bags, some scissors to cut some air/drainage holes in the bag, a little moist compost, and some sort of tie to keep the bag secured. There is the question of whether or not to transplant to pots before transplanting them to their final position, as well as the question of whether the Florence and Flamenco cultivars will even produce runners. The Cascada accepts round rootballs from pots of 9–13 cm in diameter, with 8 planting positions around the side of the planter. A further 3–5 plants (depending on rootball size and whether a bottom/middle tier or not) can be planted in the top of each tier, although you have to position them so their roots aren't going to affect the roots of those planted in the 8 holes. As it is only some plastic and a little soil the runner can just continue hanging down as it was—tying it down to a pot and hanging that would either have the pot come crashing to the ground (if the fixing comes loose) or cause damage to the runner and/or parent plant because of the weight. I have never planted so many strawberry plants before (I think the most I've ever had are 4–6) so I don't know what a strawberry glut would even look like. I've also only grown Cambridge Favourite, so an extended season is something I also don't have any experience with. But, as long as the picking and propagation plan is stuck to I will end up with 108–144 strawberry plants, and an estimated 34.2–41.4 kilograms of strawberries per year (75–91 1 lb punnets). With preservation that'd be more than 1 punnet of strawberries a week, and without preservation that is likely more than 2 punnets per week during the fruiting period. There are three main ways of preserving strawberries: preserves like jams, dehydration, and freezing. Freezing strawberries is rather simple. Pick them, clean them, check them, hull them, halve/slice them if desired, spread them on a tray, freeze them, label a bag, bag them, remove air from the bag, freeze them. They should be OK for 4–8 months. At the top end that means frozen berries could last until fresh are available the next year. Dehydrating strawberries involves using a food dehydrator. There are some videos on YouTube that cover the process. Strawberry jam is one of those things that takes time and effort (and equipment) to make. If I get through a jar of jam per month I'd need around 4 kilograms of strawberries for a year's worth of jam. Freezing looks like the way I'd go for preservation, especially since you can make jam with frozen strawberries. I put the BioBizz All-Mix, 3 Lechuza Cascada "All in One" kits, and the Lechuza Cascada 3-tier connection kit in my Amazon basket. At checkout I wondered "what does All in One mean?" so went back and had a look. The product description says it "comes with easy to follow planting instructions, Lechuza-PON granulate, and the self-watering system". One of the product images show all those items plus the base from the 3-tier kit and the connectors from the 2-tier kit. The image is probably wrong, and it looks like it is the standard Lechuza Cascada (not the 2-/3-pc tower shown as default at that link) which comes with the "stand-alone planter &plus; sub-irrigation set". The sub-irrigation set includes the Lechuza-PON material. As for the potting mix, the All-Mix was not available for next day Prime delivery. Although the Light-Mix was available for next day Prime delivery, it is "light" on nutrients (it seems better for seeds, seedlings, cuttings and soil-based hydroponics). I went ahead and checked out. As for the bare root strawberries, I already had the "Strawberry Full Season Collection (12 each of Cambridge Favourite, Florence, and Flamenco) in my Thompson & Morgan basket, and since I had decided they looked like the best choice for what I wanted went through the checkout process. A dispatch date of "By end of October 2015" is a bit vague though. Hopefully the different strawberry cultivars will be separately packaged in some way. I want to grow a different cultivar in each tier, and I also want to know that when I propagate the runners the mother plants are a specific cultivar. By November I will hopefully have planted out 36 bare root strawberry plants and they will have started adjusting to their new home. I hope the whole El Niño meaning a really cold British winter things will not happen and kill off the plants. Posted by John Cook on Tuesday, 29th September 2015 .